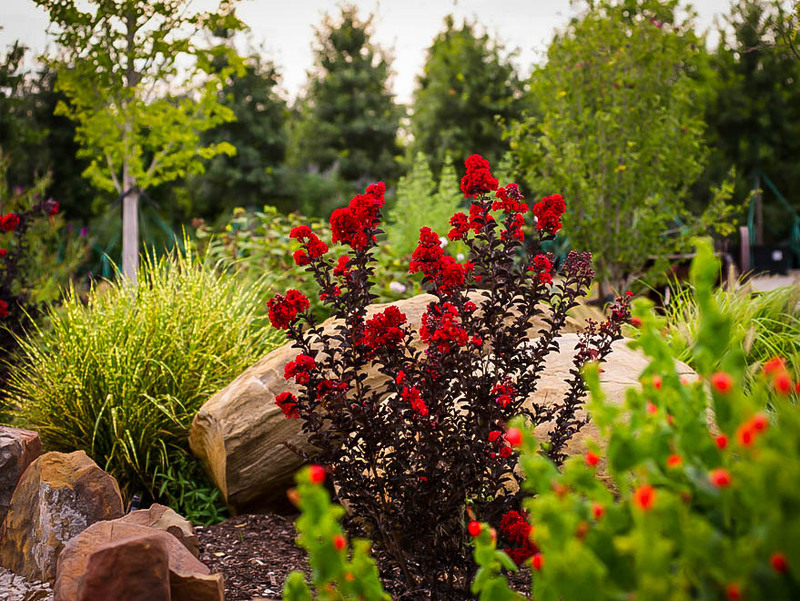 The Best Red™ Black Diamond® Crape Myrtle is a new variety of this ever-popular plant that features rich red flowers from early summer to the first frost, combined with deep red-black foliage that always looks clean and fresh. Now, a Crape Myrtle that isn’t plain green when not in flower – instead, rich foliage color to brighten your garden from early spring right up to leaf-drop. Growing no more than 12 feet tall, even if untrimmed, this tough, reliable plant fits into smaller gardens or smaller spaces with ease, and never takes over. Use it as a specimen plant, as a dense, colorful screen, or mixed with other shrubs in your garden beds and around the house. 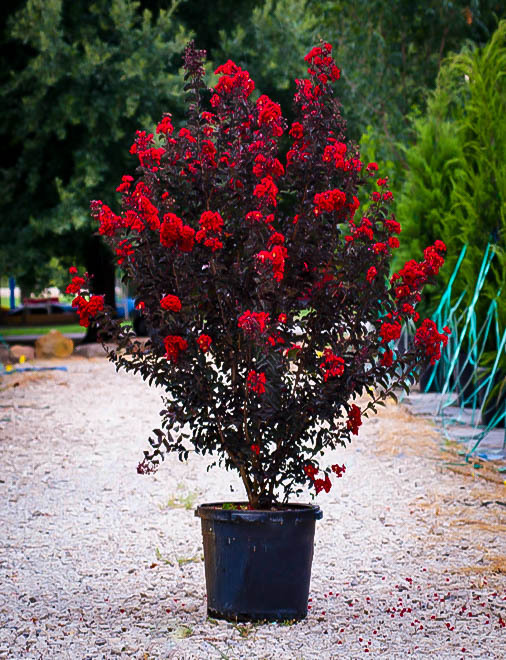 The Best Red™ Black Diamond® Crape Myrtle grows best in full sun, for the most flowers and the richest foliage color. Plant it in any well-drained soil, from sand to clay, and it even thrives in poor, rocky soil. It establishes quickly in the first year, and from then on it is drought-resistant and disease-free. In zone 6 the upper growth may die back in winter, but plants will re-sprout from the base and flower freely, although plants will then only grow between 3 and 5 feet tall. The Best Red™ Black Diamond® Crape Myrtle is the cutting edge of Crape Myrtle development, and it is a brilliant addition to the range of these plants currently available. Growing to just 12 feet tall, this plant is ideal for smaller gardens, for a screen, or for planting along a driveway. With its combination of brilliant red flowers all summer, set against red-black foliage, it really is a winner. 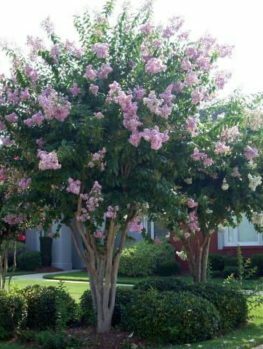 Crape Myrtles are tough, reliable shrubs and small trees, but up until recently they all had green leaves. 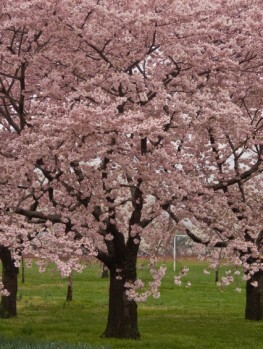 This means that in spring, once the leaves emerge, but before blooming begins, they are basically a green bush. Pleasant enough, but nothing exciting. In modern gardening we strive to have every plant ‘pay its way’ in bringing color and interest, so when a Crape Myrtle with beautiful colored leaves comes along, we sit up and take notice. 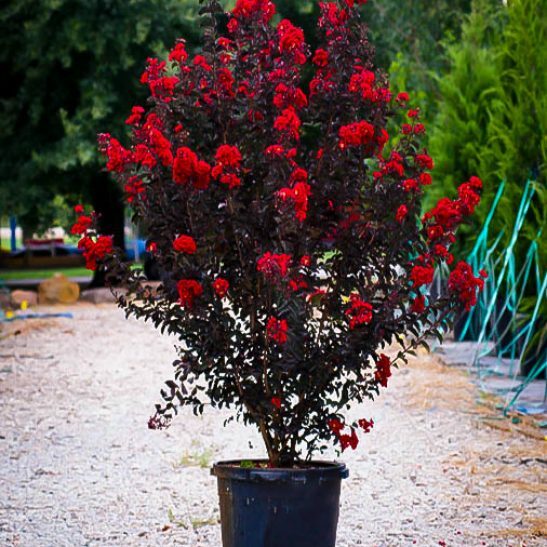 The development of the Black Diamond series of Crape Myrtles is a true breakthrough, because all the plants in this series have rich, deep red leaves that approach black, so rich is the coloring. Not only that, the leaves hold that intense color all season, from the time they first emerge to the time the last leaf drops in fall. 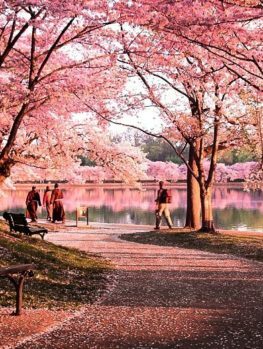 This feature elevates these Crape Myrtles beyond the level of flowering plants, into the category of foliage plants, and gives us a whole new color to play with and enjoy in laying out our gardens. 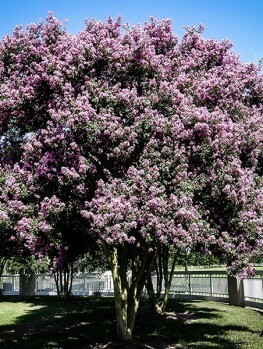 The Best Red™ Crape Myrtle grows rapidly, so that in about 4 years it will be 6 feet tall and 3 feet wide. A few years later it will reach around 12 feet tall and 8 feet wide. With trimming it can be kept shorter, but even at its natural full height it is perfect for small and medium-sized gardens. 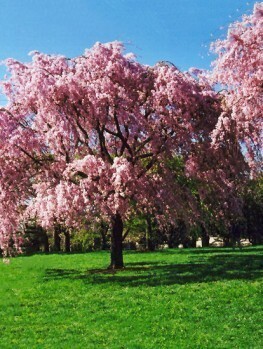 Grow it on the lawn as a specimen. Plant a row along your property line for the perfect combination of privacy and beauty. 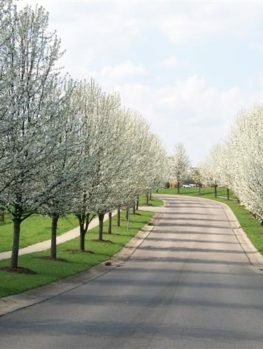 Space them out in pairs along a long driveway for an entrance that combines color and interest and makes coming home a visual treat. Plant the Best Red™ Crape Myrtle behind shorter shrubs – it will blend perfectly with pinks, purples and blues in the landscape. Whatever way you use this plant on your property you will love it. Oh yes, and it also flowers – not just for a week or two, but for months. Starting in early summer and continuing up until the first frost, every branch will be tipped with a 4 to 6-inch cluster of about 15 large blooms, each one crinkled like crape paper, and colored a deep, rich, true red. The heart of the flower is yellow. The effect of these blooms against the background of red-black leaves is truly stunning, and something you will adore. You can encourage the most flowers over the longest period by removing old clusters as soon as the last flowers in them fade. Cut back only to the first pair of full-sized leaves. New shoots, tipped with more flowers, will soon push out. Leaving the last clusters for the season uncut will give you attractive seed heads that persist into winter, adding interest in that season of dormancy. You can leave your Best Red™ Crape Myrtle to grow naturally, or you can prune it in late winter for a smaller plant. Before the leaves emerge, cut back stems from the previous year by just a few inches, or back to just above the older wood, depending on how tall you want to maintain your plants. Because Crape Myrtle bushes flower on the new growth produced each spring, pruning in late winter or early spring will not reduce flowering. 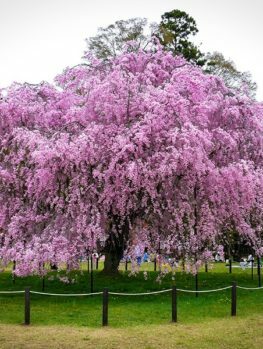 Do not trim new growth in summer, except to remove spent flower heads, or you will reduce the flowering ability of your tree. The Best Red™ Crape Myrtle is hardy from zone 6 to zone 9. During winter in zone 6, young stems may die back, depending on the intensity of the season and how exposed plants are, but this plant will reliably re-sprout from the base. Wait until you see bud-break, and then remove any dead wood completely. In zone 6 plants will usually grow to between 3 and 5 feet tall. The Best Red™ Black Diamond® Crape Myrtle originated in a breeding program begun by Dr. Cecil Pounder, a Research Geneticist at the Thad Cochran Southern Horticulture Laboratory, Poplarville, Mississippi. This is a division of the US Department of Agriculture’s Agricultural Research Service. He worked with the first-ever all-season red-leaf Crape Myrtle, a variety called ‘Chocolate Mocha’, to make hybrid plants and create his Ebony series. 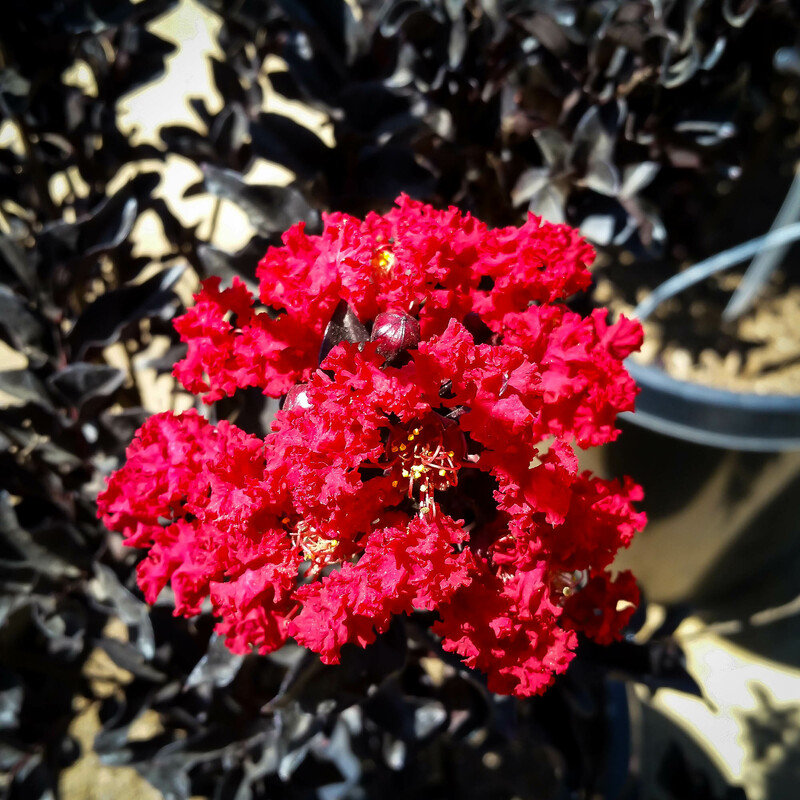 The botanical name for the Best Red™ Crape Myrtle is ‘Ebony Flame’. 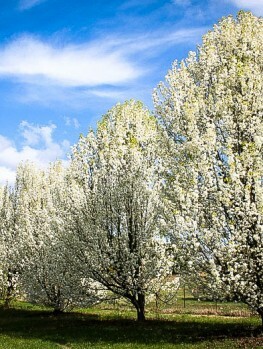 The J. Berry Nursery brought Dr. Pounder’s public-funded work to gardeners by creating the Black Diamond® series, which we are featuring at the Tree Center. Our plants come straight from the grower, and are accurate copies of these unique plants, not seedlings of no particular value, which may be available much more cheaply elsewhere. We know that these plants will be in high demand, and stocks are limited. Order now or be disappointed.